On 19th May 2016 a public discussion on „Sustainable Development Goals: Better World by 2030“ was held in Sofia, Bulgaria. Keynote speaker was Mrs. Irina Bokova, UNESCO Director-General and candidate for UN Secretary General. In her inspiring speech Mrs. Bokova stressed the importance of the 17 Sustainable Goals, that had been elaborated and would be implemented for the first time in close cooperation with governments, civil society, the private sector and academia. „In the recent years the international community has hardly rallied round something as universal and changing the countries as the 2030 Agenda for Sustainable Development adopted by the UN last September“, stated Mrs. Bokova. This is the second public presentation of the 2015+ Strategic Plan after the discussion-meeting on the 1st of March, 2016, discussing the UN Sustainable Development Goals, titled “THE BUSINESS – A FORCE FOR GOOD”. 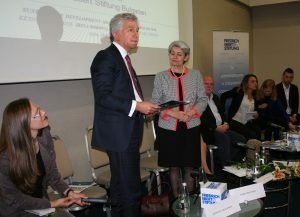 Mrs. Bokova is the second public figure, after the President of the Republic of Bulgaria, Mr. Rosen Plevneliev, who received a personalized copy of the Plan as a guarantee for the engagement of the responsible business. With this public act the Bulgarian Network declares that it realizes the responsibility and opportunity to be the proactive side in outlining the road and the implementation of the Goals. The Local Network is striving for and will continue to motivate and inspire the various stakeholders in developing and sharing their agendas, and in achieving together the same synergism, characterizing the Network’s collective projects, with the aim of translating the Global Goals into the local reality.